Hello readers! I’m so sorry for my absence these past couple of months… work has been crazy with Vino and Vinyasa classes, workshops, planning my upcoming retreat, dog sitting gigs etc etc. 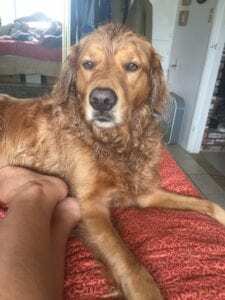 Last month in particular was a horrible time for our family as our beloved dog Corduroy passed away very unexpectedly at the young age of six after a hike. We were on a normal hike on a cool Sunday morning and when we were about five minutes away from the parking lot, he sat down and wouldn’t get up. Long story short I knew something was clearly wrong and rushed him to vet ER but by the time we had driven the five minutes to get there, he has passed away in the car. The vet said Corduroy had an undiagnosed heart condition and it literally could have happened at any time and that we should be thankful he was doing something he loved to do like hiking when he passed. Those of you who know me and Andy well know that our dogs mean the world to us and they are family to us- not like family, they are family and we were devastated as was Sugar, our 12-year-old mutt who has now outlived two dogs and two cats. You can read more about how I LOVE my animals more than I LIKE most people here if you’re so inclined. 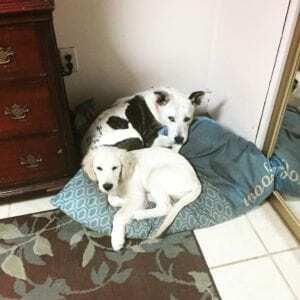 We didn’t wait long to get a puppy as we, Sugar included, were miserable and needed to fill the void somehow. 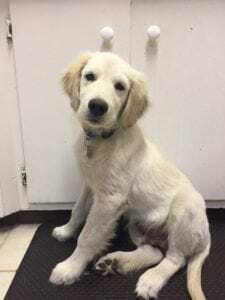 So we got another Golden Retriever, this time an English though, and where Corduroy was red, Paddington is cream colored. And yes, I name my dogs after my favorite storybook bears if you’re wondering! Having a puppy again is so much fun and Sugar is already allowing him to share her bed with her which she has never done before. It’s pretty cute. The weather here on the Central Coast is finally feeling like fall and I don’t feel inclined to spend every free moment outside keeping busy. These days a cup of tea and a good book on my recliner sounds just right and I have some good suggestions for you today. During Halloween time I like to read books that make my skin crawl if you know what I mean. Murder mysteries, drug memoirs and thrillers are right my alley.. tis the season! 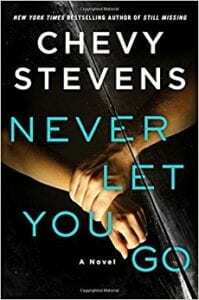 This first book “Never Let You Go” is by one of my favorite writers, Chevy Stevens. Her books are enthralling like this one about a wife who escaped into the night with her young daughter and left an abusive relationship. Her husband was sent to jail and Lindsay, the wife, starts over with a new life, business and outlook on life. Fast forward to when her now ex-husband gets released from jail and she feels he is stalking her and watching her every move. Behind her back, her daughter begins seeing her father and is convinced that he is a different person and is rehabilitated. There are so many twists in this book it’s hard to put down- a true thriller. 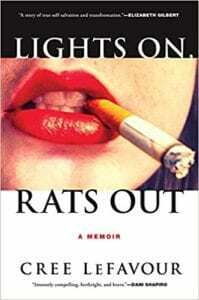 This second book “Light On, Rats Out” is a brave memoir from Cree LeFavour who is addicted to self harm in the form of burning herself with cigarettes. 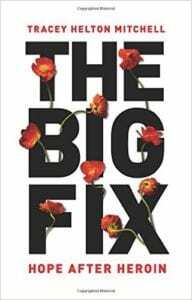 As a young college graduate, Cree enters herself into a year long program with a psychiatrist and has a very paralyzing relationship with him, who she calls Dr. X. Their relationship is anything but normal and her book is based off of the maticulous notes he took while she was in treatment. She is committed to keeping him in her life whatever the consequences and the dialogue between them is fascinating as is her transformation from a wounded (and wounding) woman to one who can forgive herself and her past for her mistakes. Okay, so enough about books! You came here for food and a new recipe is what I’m here to deliver to you today! 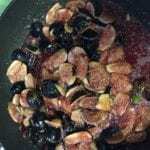 On Wednesdays I always visit my local Farmer’s Market and this week I couldn’t resist these fresh figs that can be used in so many different things. 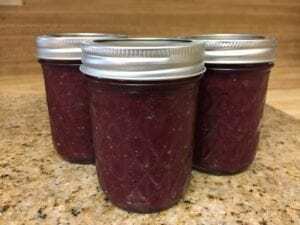 Today though, here’s an easy peasy recipe for fig spread or jam which you can put on bruschetta, crackers, toast, cheese… and the possibilities are endless! 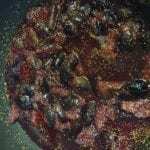 Turn the heat to low, add the water and simmer for 20 minutes, stirring occasionally until the juice begins to thicken. 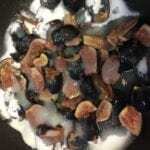 Buzz in the blender until the figs look more like a thick juice. 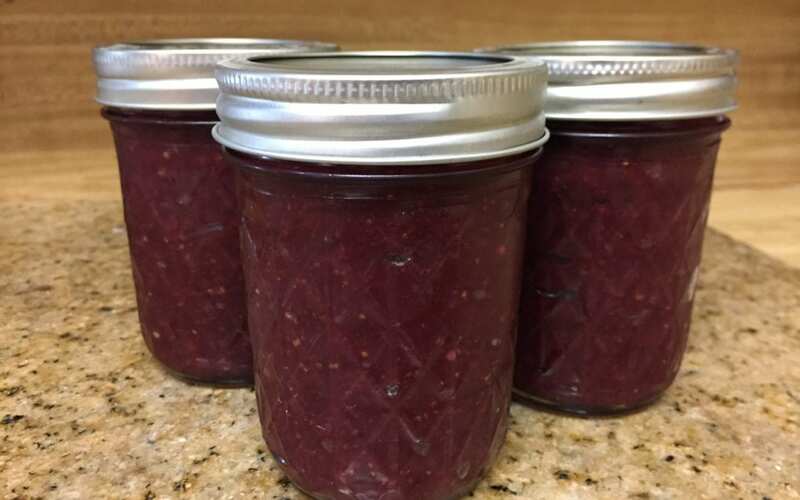 Spoon into jars and allow to cool. Wallah! Thanks for the book recommendations! I think my sis will be really into the last one.